Mac OS X Yosemite is a big release – it includes a bunch of new features that help it integrate better with iOS 8 and boasts one of the most significant visual redesigns the Mac operating system has seen in years. All that eye candy is straining older Macs, though. If you’ve updated to Yosemite and noticed a significant slowdown in performance, you’re not alone. Like most new OS X releases, its advancements also require more computing power than the previous version. But that doesn’t mean your older Mac is out of luck… there’s a quick fix that is sure to make your machine more responsive. You’re going to have to be willing to part with some of Yosemite’s fancy visual effects, though! First, make sure you’ve given your Mac a day or two after upgrading to let it sort out all the new changes. Even though Yosemite is ready for you to use, it’s still doing some things behind the scenes. For example, Spotlight search tends to re-index all of your files after a big upgrade, which can take a while depending on how much data is on your computer. 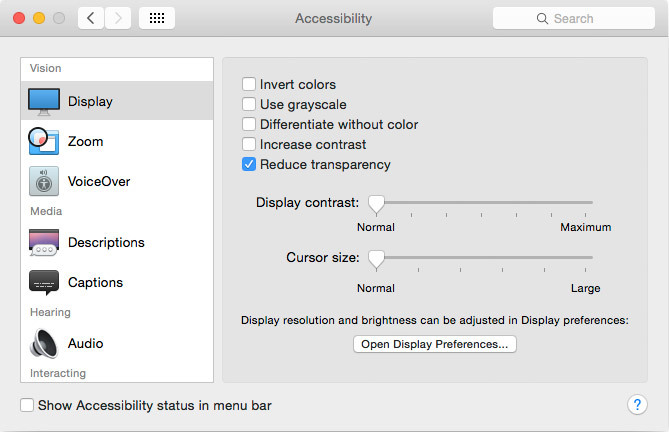 If your Mac is still sluggish, it’s time to give up transparency. Click on the Accessibility icon (4th row). From the list on the left, select Display. Done! You’ll notice the menu bar, Dock, and your app windows are now opaque instead of see-through. While it may not be as pretty, it’s a lot less stressful on your Mac’s graphics card and RAM, and will be a lot quicker as you click and drag windows around. I did a clean install of Yosemite and it solved all the problems. It is running perfectly now!